ABSTRACT: In our research, we are examining public involvement and participation processes in urban agriculture in Portland, Oregon and Montreal, Quebec. First, we explored the history of public participation in the North American context in order to orient public involvement practices in both Montreal & Portland. We are now in the process of analyzing more than three dozen case studies to help understand how UA practitioners envision and undertake their public involvement processes, highlighting key themes of democracy, inclusion, and empowerment through the lens of participatory democracy and collaborative planning. In the second part, we create a typology of participation based on these recent efforts of Urban Agriculture land use planning, policy, and regulation by governing bodies, community based organizations, and UA practitioners. How do organizations seek to include those who have not traditionally had a voice in the planning process? What best practices are being used by government agencies and community-based organizations to engage a representative public? Through an exploration of the literature on participatory planning and examples in both Portland and Montreal, we will outline the best practices and principles of public participation in governing and regulatory processes. We are writing a paper to present at the Association of American Geographers Annual Conference in San Francisco in April of 2016. The aim of the paper is to create space for urban agriculture (UA) practitioners, scholars, and policymakers to reflect upon, plan for, and potentially leverage the role of UA in cycles of investment and disinvestment. We point to the fact that UA is one of many interrelated factors that contribute to gentrification and displacement. We'd love feedback on the abstract in the comments and will post the paper here before the conference! 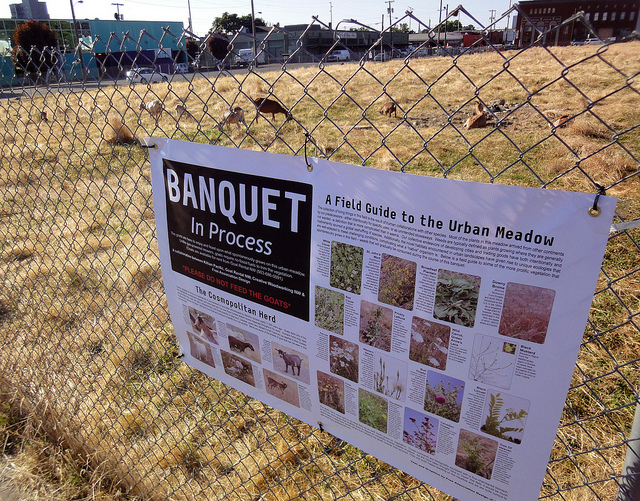 Without further adieu ..
Urban agriculture projects often locate in low-income neighborhoods where vacant lots and other spaces are relatively accessible to budding urban farmers, community gardeners, and food justice activists. Locating in these neighborhoods also helps enable the inclusion of marginalized communities – an objective that is often central to the mission of urban agriculture practitioners. Common goals include providing urban greenspace and community gathering space, offering gardening and nutrition education, and expanding fresh food options in the neighborhood. Yet, in providing these amenities, urban agriculture projects sometimes contribute to gentrification and therefore play a role in displacing the very communities they intend to serve. In this paper we explore these tensions in Portland, Oregon and Montreal, Quebec, two cities renowned for their vibrant urban agriculture scenes and innovations in urban sustainability planning. Based on intensive fieldwork in August 2015, our research includes over two-dozen semi-structured interviews with government officials, city planners, and urban agriculture practitioners, as well as site visits to collective and community gardens, commercial and non-profit farms, rooftop beehives, school gardens, community orchards, ecoquartiers and ecodistricts. We position urban agriculture practice as a spatial and cultural urban frontier implicated in the investment and disinvestment cycles of uneven development . We compare how the tensions between urban agriculture and gentrification manifest in these two North American cities, and we raise questions about what types of policy and planning—both within and beyond the realm of urban agriculture—might best serve existing communities in place and resist tendencies towards displacement and gentrification. After our summer field work ended, the students from Portland State University split into three groups, each of which decided to explore different topics based on our findings. Over the next few months, all three groups will be sharing reports on our chosen topics. You can read about the other two topics HERE and HERE. Our group (Gwyn, Dirk, and Claire) has chosen to focus on how the image of urban agriculture (UA) has been deployed in Portland and Montreal, and for what purposes. We use Guy Debord’s classic work, The Society of Spectacle (1967), in order to interrogate how UA is increasingly being deployed as a form of ‘spectacle’. For Debord, the concept of the spectacle primarily refers to the intensification of capitalist development. Debord’s spectacle is characterized by the production and dissemination of images, which commodify and colonize spaces and social relations for the advancement of capital accumulation. In recent decades, the ‘spectacle’ has `become a touchstone for urban theorists engaging with the impact of increased cultural production and its urban manifestations. This includes the development of cultural amenities such as festivals, spaces of leisure, and mega-events. Beyond simple representation, Debord’s spectacle embodies the tension between emancipatory practice and the commodification of everyday life. As cities seek to develop global brands built on sustainability and innovation, “green” practices such as urban agriculture (UA) are increasingly deployed as yet another cultural amenity. Although the literature has extensively examined UA, its spectacular dimensions have yet to be fully explored. Drawing on fieldwork from Montréal, Québec and Portland, Oregon we critically and dialectically analyze UA initiatives in order to understand how these practices reflect the contradictions and conflicts inherent to capitalist urban systems. Our analysis reveals two distinct forms of ‘spectacle’ associated with UA; (1) an abstract and performative spectacle related to the appearance and image of UA, and (2) a concrete, grounded version embodied in material urban space. Ultimately, we hope to reveal how UA is simultaneously subsumed by capitalist accumulation, and deployed as an emancipatory tool - as the two types of spectacle - albeit differently in each city. Have you heard of the Belmont Goats? A couple of years back, in 2010, a landscape architect interested in landscape management, urban agriculture and biophilia, pulled together an experiment of the caprine kind. He was studying vegetation successions on a 2-acre urban vacant lot in the Southeast of Portland when the idea came to use goats for trimming the grasses instead of using a gas-powered mower. 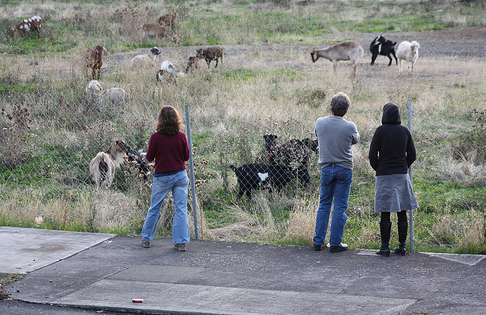 He pitched the idea to the developers that own the land and managed to convince them to rend a head of goats by explaining how this practice could bring about environmental benefits (no air pollution and reduced weed dispersal, since most weed seeds are not viable after they have passed through the goat’s digestive system) as well as social benefits (since people would most likely be attracted to and entertained by the goats). 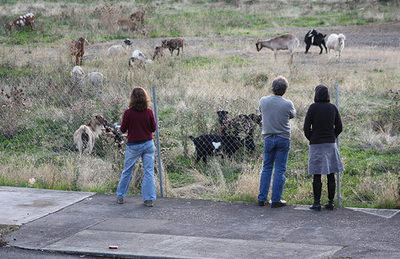 A few of the Belmont Goats as portrayed on their website. In 2012, a business owner with a shop right across the street of what are now known as the Goat Blocks decided to adopt a herd and keep it on the lot permanently. During the following year, the goats became more and more famous and loved by the community – they have their own website and upwards of 4000 Facebook friends and 1500 Twitter followers. Unfortunately the developers needed to start building the mixed-use project they had meanwhile envisioned for the lot. Hence, the goats got an eviction notice. 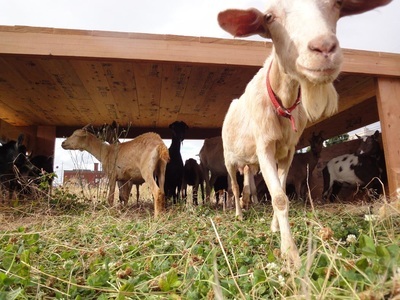 In order to avoid splitting the herd, a few of the neighbours that were helping take care of the goats decided to purchase them and find them a new home, on another visible and accessible space. Theirs was the classic Portland coming-of-age story. They found a home in Southeast in 2012, grew their young family, established an identity, a community and friends. Then they moved toward the suburbs. They can now be found on a lot owned by the Portland Development Commission in Lents, a neighborhood in East Portland. One of the current owners told us he was very thankful of how accommodating the developers were by hosting the goats for a little longer while he was trying to secure another place to move them to. Eventually, he changed neighborhoods as well in order to be closer to the goats. 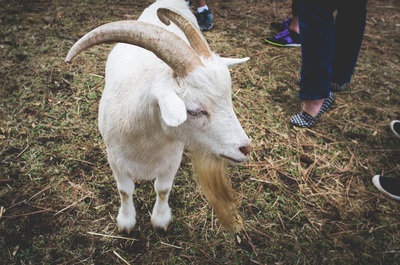 Now that you know the story of the Belmont Goats, doesn’t it sound strangely familiar? This space lied vacant, uninteresting, invaded by undesirable weeds, until an entertaining, creative solution is brought forth to keep those undesirables in check. All of the sudden the space is noticed by people who walk by. They develop a strong enough emotional attachment to it, they tell their friends about it. When the time comes to transform that space into something that is profitable, the collectively memory of this creativity might just make someone buy into the whole idea. In the words of commercial real estate market manager for the U.S. Bank in Portland about the development on the Goat Blocks: ‘The mixed-use style project and fun recent history of the site will create a vibrant urban space and attract shoppers and residents throughout the region.’ And without doubt, the developers knew how to take advantage of this ‘fun recent history’. 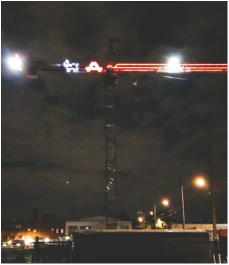 The project is still in the construction phase, but we can already see the goat imagery lit up on the cranes at night. LOCA (a.k.a. the Goat Blocks!) is a collection of mixed-use buildings being developed in the heart of Portland’s eclectic Central Eastside. 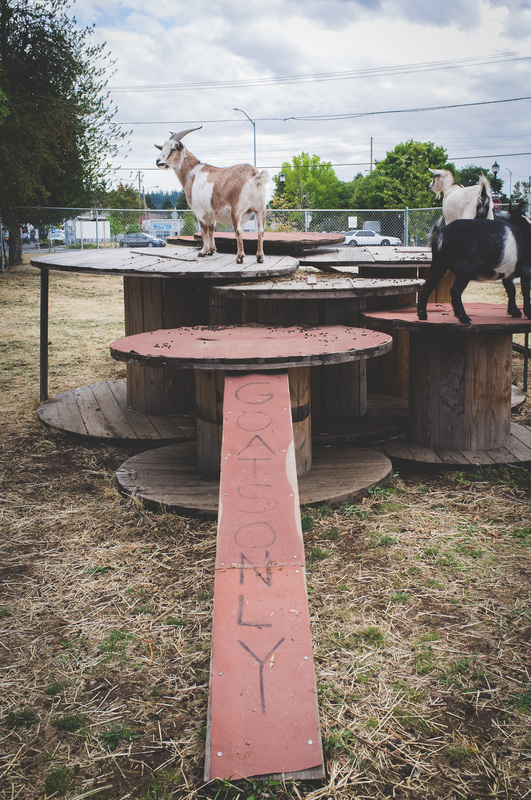 Lying at the center of multi-modal human-flow, this three-city block site is designed to provide an authentic urban living room for residents, customers (and perhaps, a few goats). In some ways, the Belmont Goats acted as catalysts, moving into an underdeveloped space, making it more desirable through their sheer presence right before being pushed away towards underused spaces further out from the center, leaving the space for other more profitable activities. The problem with agriculture is that we simultaneously need it to be close to us, but we also want it to be on land that can’t be used for development. As the urban growth boundary’s effects lead to the densification of Portland’s neighborhoods, theses privileged spaces where residents can make regular contact with nature, whether it’s urban fauna or flora, are becoming increasingly scarce. The planning choices that are made now will affect how people interact with nature and their food system for years to come. That’s quite a large responsibility to take on, especially when knowledge of food system planning and advocacy for food justice are tools rarely mastered by urban planners. To conclude on a lighter note, the good news is the city of Portland allows its residents to keep on their property fowl, horses, mules, burros, asses, cattle, sheep, goats, llamas, emu, ostriches, rabbits and swine, provided they are properly housed and taken care of. 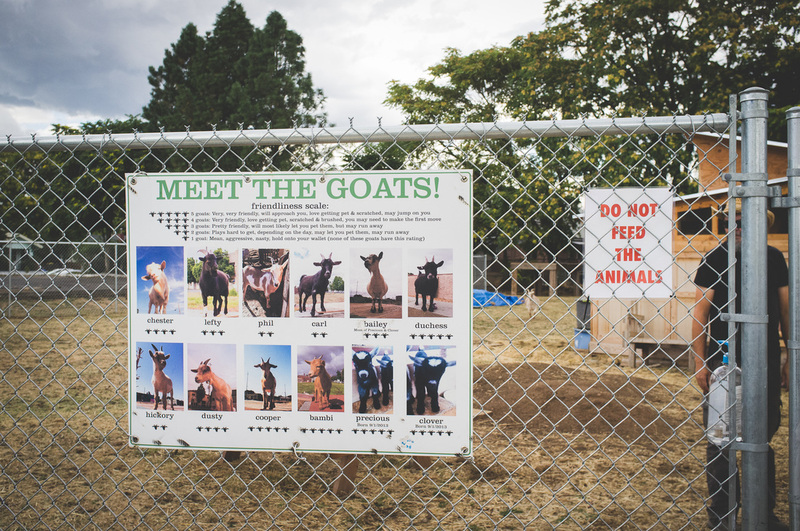 I’m not surprised I found people in Portland to be so relaxed and easy going – maybe Montrealers would be too if they could spend a few minutes a day petting some goats or collecting some fresh chicken eggs. Just some food for thought – maybe it’s time to bring back ‘Ma poule à Montréal’!